Castro's reign over the island-nation 90 miles (145 kilometers) from Florida was marked by the U.S.-backed Bay of Pigs invasion in 1961 and the Cuban Missile Crisis a year later that brought the world to the brink of nuclear war. The bearded revolutionary, who survived a crippling U.S. trade embargo as well as dozens, possibly hundreds, of assassination plots, died 10 years after ill health forced him to hand power over to Raul. "Socialism or death" remained Castro's rallying cry even as Western-style democracy swept the globe and other communist regimes in China and Vietnam embraced capitalism, leaving this island of 11 million people an economically crippled Marxist curiosity. He survived long enough to see Raul Castro negotiate an opening with U.S. President Barack Obama on Dec. 17, 2014, when Washington and Havana announced they would move to restore diplomatic ties for the first time since they were severed in 1961. He cautiously blessed the historic deal with his lifelong enemy in a letter published after a month-long silence. Obama made a historic visit to Havana in March 2016. Carlos Rodriguez, 15, was sitting in Havana's Miramar neighborhood when he heard that Fidel Castro had died. "Fidel? Fidel?" he said, slapping his head in shock. "That's not what I was expecting. One always thought that he would last forever. It doesn't seem true." "It's a tragedy," said 22-year-old nurse Dayan Montalvo. "We all grew up with him. I feel really hurt by the news that we just heard." Fidel Castro Ruz was born Aug. 13, 1926, in eastern Cuba's sugar country, where his Spanish immigrant father worked first recruiting labor for U.S. sugar companies and later built up a prosperous plantation of his own. Fidel turned his trial defense into a manifesto that he smuggled out of jail, famously declaring, "History will absolve me." Freed under a pardon, Castro fled to Mexico and organized a rebel band that returned in 1956, sailing across the Gulf of Mexico to Cuba on a yacht named Granma. After losing most of his group in a bungled landing, he rallied support in Cuba's eastern Sierra Maestra mountains. Three years later, tens of thousands spilled into the streets of Havana to celebrate Batista's downfall and catch a glimpse of Castro as his rebel caravan arrived in the capital on Jan. 8, 1959. The U.S. was among the first to formally recognize his government, cautiously trusting Castro's early assurances he merely wanted to restore democracy, not install socialism. In 1964, Castro acknowledged holding 15,000 political prisoners. Hundreds of thousands of Cubans fled, including Castro's daughter Alina Fernandez Revuelta and his younger sister Juana. Still, the revolution thrilled millions in Cuba and across Latin America who saw it as an example of how the seemingly arrogant Yankees could be defied. And many on the island were happy to see the seizure of property of the landed class, the expulsion of American gangsters and the closure of their casinos. Castro's speeches, lasting up to six hours, became the soundtrack of Cuban life and his 269-minute speech to the U.N. General Assembly in 1960 set the world body's record for length that still stood more than five decades later. As Castro moved into the Soviet bloc, Washington began working to oust him, cutting U.S. purchases of sugar, the island's economic mainstay. Castro, in turn, confiscated $1 billion in U.S. assets. The American government imposed a trade embargo, banning virtually all U.S. exports to the island except for food and medicine, and it severed diplomatic ties on Jan. 3, 1961. On April 16 of that year, Castro declared his revolution to be socialist, and the next day, about 1,400 Cuban exiles stormed the beach at the Bay of Pigs on Cuba's south coast. But the CIA-backed invasion failed. The debacle forced the U.S. to give up on the idea of invading Cuba, but that didn't stop Washington and Castro's exiled enemies from trying to do him in. 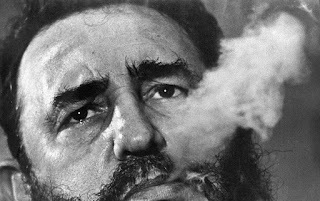 By Cuban count, he was the target of more than 630 assassination plots by militant Cuban exiles or the U.S. government. Aided by a tourism boom, the economy slowly recovered and Castro steadily reasserted government control, stifling much of the limited free enterprise tolerated during harder times. As flamboyant as he was in public, Castro tried to lead a discreet private life. He and his first wife, Mirta Diaz Balart, had one son before divorcing in 1956. Then, for more than four decades, Castro had a relationship with Dalia Soto del Valle. They had five sons together and were said to have married quietly in 1980. By the time Castro resigned 49 years after his triumphant arrival in Havana, he was the world's longest ruling head of government, aside from monarchs. In retirement, Castro voiced unwavering support as Raul slowly but deliberately enacted sweeping changes to the Marxist system he had built. His longevity allowed the younger brother to consolidate control, perhaps lengthening the revolution well past both men's lives. In February 2013, Raul announced that he would retire as president in 2018 and named newly minted Vice President Miguel Diaz-Canel as his successor. "I'll be 90 years old soon," Castro said at an April 2016 Communist Party congress where he made his most extensive public appearance in years. "Soon I'll be like all the others. The time will come for all of us, but the ideas of the Cuban Communists will remain as proof that on this planet, if one works with fervor and dignity, they can produce the material and cultural goods that human beings need and that need to be fought for without ever giving up." Cuba's government announced that Castro's ashes would be interred on Dec. 4 in the eastern city of Santiago that was a birthplace of his revolution. That will follow more than a week of honors, including a nearly nationwide caravan retracing, in reverse, his tour from Santiago to Havana with the triumph of the revolution in 1959.